More or Less a Week ago i opened a Poll about the future of the “In The Latest Chapter Of…” Covering Articles (You can still vote, but those results won´t be taken into account though). And now the results are here! -Continue with the Vanguard Articles since I Enjoy them! -Continue but with a new Anime for this Fall Season since I Enjoy reading it! -Continue but only Focus on Saintia Sho and World War Blue! -What´s a In the Latest Chapter Of? First. Thank you for the ones who took their time and participate! Your Feedback it is truly appreciated! Continue but with a new Anime for this Fall Season since I Enjoy reading it!!! 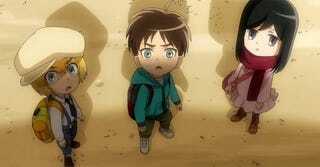 Attack on Titan Junior High! The first covering will come this Sunday Evening, since the morning schedule will be used for the last chapter of this Season of Cardfight!! Vanguard G, after that, you can expect a new article every Sunday morning. I decided for it since I am not a fan of Attack on Titan (And I am still aren´t one) and my knowledge for the franchise is little, I mean I know that it is in an apocalyptic world where Giant Sized people likes to eat Normal Size people. But still, I decided it in order to make this my entrance to this franchise, and I think it will be interesting to see the point of view of someone truly ignorant of Attack on Titan. So Wish me Luck! The “What´s a In the Latest Chapter Of…?” Was the second most popular, even if it was a joke answer xD, but still. If you don´t know what it is, I invite you in order to know and accompanying us in this new journey! The Answer “Continue with the Vanguard Articles since I Enjoy them!” Was the third most popular. And for the people, who voted for this I have to tell them that, don´t be sad. This is not the end for my Vanguard Articles, since I love this anime very much, since they will come back, but in a more sporadic way and talking about the show in general, instead of a chapter by chapter in a weekly basis. So Yeah, cheer up! And this will give me a chance to make a more profound article about this amazing franchise! Finally The Answer “Continue but only Focus on Saintia Sho and World War Blue!” Got No Votes. And I truly feels that it is a form of flattery! Since I understand that the people want more of “In the Latest Chapter Of…”! So Thank you and I Will do my best! With nothing more to say, I invite all of you to enjoy with me this Sunday for the last covering article of Vanguard, and the first covering article of Attack on Titan Junior High!